Scotch broom is a deciduous shrub that has multiple varieties, each with their own unique growing habit. Scotch broom are drought-tolerant and grow well in poor soils where other shrubs would fail to survive. These plants become covered with small but brightly colored blooms in the spring through early summer. Scotch broom was introduced in some states in mass plantings along roadsides and on slopes to protect the soil from erosion. In some states, Scotch broom is invasive. 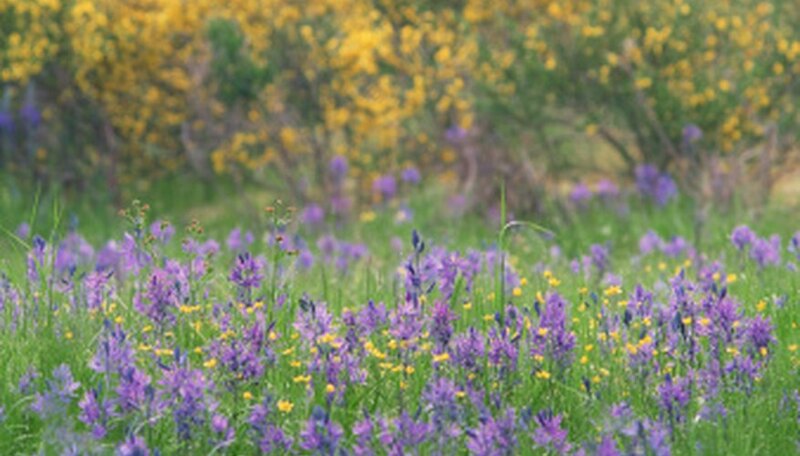 Before planting Scotch broom, check with a local extension office to determine if it is allowed in your state. Lena Scotch broom, or Cytisus scoparius "Lena," is know for its fiery red, orange and yellow blooms that appear in early May through mid June. It is a compact variety of Scotch broom barely reaching heights of 5 feet. Lena Scotch broom is very drought tolerant, can survive in salty soils and will grow in part shade to full sun areas. Lena Scotch brooms work well planted in large groupings where their bright blooms mass together to make an eye-catching display of color. Cytisus scoparius "Burkwoodii" is know by the common name Burkwood's broom. This Scotch broom variety is a fast growing shrub with a mature height of 5 to 7 feet. Its rose-colored blooms appear at the end of May and darken to a deep burgundy before dropping the beginning of July. Burkwood's broom grows in a fountainlike shape, requires full sun and is highly drought-tolerant. Burkwood's broom has been known to attract butterflies. They work well in individual or group plantings as accent plants, borders or hedges. The Allgold Scotch broom, or Cytisus x praecox "Allgold," has a rounded, dense habit. It can grow to 5 or 6 feet in height and width. Allgold Scotch brooms are named for their bright yellow flowers that appear in the spring. Their bright blooms contrast with the tiny green leaves that cover each stem. They require full sun to thrive. Its compact habit makes it an excellent choice for mass plantings, borders or country gardens. Cytisus scoparius "Lilac Time" is a slower growing variety of Scotch broom. It will reach an average height of 3 to 4 feet with an equal spread. Lilac Time broom has lilac-pink to purple-colored spring blooms. It requires full sun conditions and is not as drought-tolerant as the other broom varieties as it requires more water during periods of drought. Moonlight Scotch, or Cytisus scoparius "Moonlight," produce pale yellow to creamy white flowers in late spring to early summer. Moonlight Scotch is the smallest of the varieties achieving a height and width of 2 1/2 feet. It has a rounded growing habit that requires full to partial sun. The blooming branches can be clipped and used in floral arrangements. Moonlight Scotch can be grown in large containers as specimen plants or in low borders.